Botanist have divided the world into six Floral Regions (aka Floristic Kingdoms). 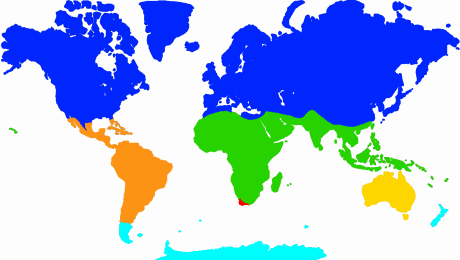 Five regions are the size of continents, but one small part of one small country is so rich and diverse in plant species that it was declared the 6th Region. 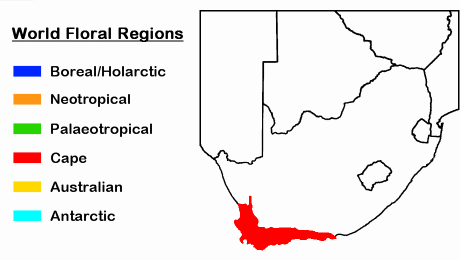 This is the Cape Floral Region (CFR). UNESCO.org: In 2004 UNESCO declared the CFR as a World Heritage Site due to its extraordinary assemblage of plant life and outstanding diversity, density and endemism of the flora. The diagram below shows the world’s six Floral Regions. South Africa’s national flower, the King Protea, is perhaps the most famous species of Fynbos (large pink flower in top image). Interestingly, many Fynbos plants depend on fire for their survival, some needing the heat for their seeds to germinate. The famous Swedish botanist Carl Linnaeus described the CFR as “This Heaven on Earth”. UK botanist Ronald Good said “the Cape region is also of special interest because it has contributed much to the beauty of European gardens” (from his famous book “The Geography of the Flowering Plants”). Good Places to experience the CFR include: Table Mountain National Park, Kirstenbosch National Botanical Garden, Garden Route, a Nature Reserve or Harold Porter National Botanical Garden (on Clarence Drive).